Made by Marshall Sons & Co Ltd in Gainsborough, England, 1909. In a compound steam engine, steam works first in a high pressure cylinder and then in one or more lower pressure cylinders, to achieve higher efficiency than a simple engine. There are three types of two-stage compound steam engines: tandem, Woolf type and receiver type. This engine is of the receiver type. In the tandem engine both the high pressure and the low pressure pistons are mounted on the same piston rod (see Belliss & Morcom engine, object B1603). In the Woolf and receiver types the cylinders are adjacent to one another with separate piston and connecting rods and cranks. In the Woolf type the cranks are 180o apart, whereas in the receiver type the cranks are 90 degrees apart, with the high pressure crank leading the low pressure crank. In the Woolf type, exhaust steam from the high pressure cylinder is fed directly to the low pressure cylinder; the driving torque (for a double acting engine) reaches two peaks per revolution and thus varies greatly throughout each stroke. In the receiver type, exhaust steam from the high pressure cylinder is first led to a storage chamber and thence to the low pressure cylinder; the driving torque reaches four peaks per revolution and is therefore less variable. In this engine the casting containing the high and low pressure cylinders is bulky since it also contains, on top, the receiver chamber, whose volume is normally about 50% greater than the swept volume of the high pressure cylinder. Steam admission and exhaust, for both cylinders, is controlled by slide valves. On the high pressure side there is also an expansion valve. The slide valves, which are controlled by eccentrics on the crankshaft, regulate the supply of steam to the cylinders, whereas the expansion valve, also driven from the crankshaft but controlled by the governor, acts to cut off the steam supply to the high pressure cylinder in order to regulate the engine speed. The governor is a Hartnell Automatic Expansion spring loaded type, which comprises two spherical weights connected to bell cranks so that, as the engine begins to run too fast, the resulting outward motion of the weights raises a spring-resisted sleeve on the governor shaft. The main slide valve is driven by an eccentric, and an additional eccentric is connected to the cut-off valve via a slotted 'expansion link'. As the engine speed increases, the sleeve raises the expansion link and the steam cut-off occurs earlier, thus reducing steam flow and slowing the engine. The governor weights are large in order to provide the force necessary to move the mechanism. This L class engine is numbered 52700. It developed 80 horsepower at 135 rpm. Its stroke is 400 mm and cylinder diameters are 240 mm (high pressure) and 350 mm (low pressure). On maker's plate: MARSHALL SONS & CO. LD. / ENGINEERS / GAINSBOROUGH, ENGLAND. / NO. 52700. The engine number appears on the plate twice, on each side of the word 'engineers'. The engine was manufactured by Marshall Sons & Co Ltd of Gainsborough, Lincolnshire, England in 1909. William Marshall set up in business as a millwright and engineer at Gainsborough in 1848. By 1849 he was making, and winning an award for, portable threshing machines, which separated grain from chaff and straw in a single operation. William's sons soon joined him in the business, James in 1849 and Henry in 1853. They moved to larger premises in 1855 and established the Britannia Iron Works, which was to grow into a major enterprise making a wide range of engines, boilers, tractors and other machines. The company made its first tractor in 1908 and it produced a range of agricultural machinery after World War I. In 1968 it became part of the Thos W Ward Group, which was taken over by British Leyland in 1974. In 1979 this part of Leyland was acquired by Mr C Nickerson and began making crawler tractors under the name Track Marshall Ltd. It was still trading under that name in the early decades of the twenty-first century. The engine spent its working life in Victoria in two different industries. It was supplied through Robinson Bros of 48 Lorimer Street, South Melbourne, to Charles Ruwolt & Co, Engineers, Wangaratta, in January 1911 and installed on the dredge Maori Queen No 2 for the Maori Queen Gold Dredging Co, Bright. It was owned and used from 1940 to 1975 by the Ingleton sawmill at Stawell. Mr Charles Ruwolt was born on 19 March 1873 at Mieckenhagen, Mecklenburg-Schwerin, Germany. The family migrated to Australia in 1878 and took up wheat-farming at Mount Gambier, South Australia. During his apprenticeship in 1886-90 with James Martin & Co., machinery manufacturers at Gawler, he attended the State technical school there. 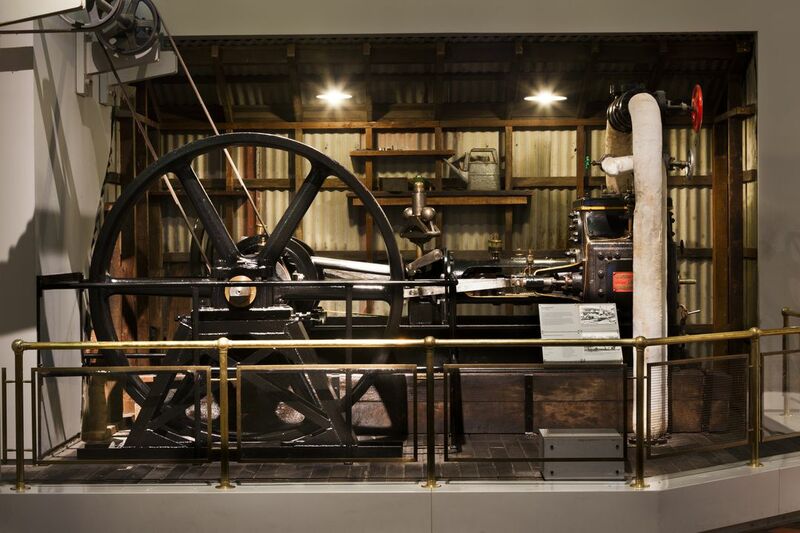 For the next decade Ruwolt worked with various Victorian foundries and engineering manufacturers, including James Alston & Co of Warrnambool, the Phoenix Foundry of Ballarat, Austral Otis of South Melbourne, and Thompsons of Castlemaine. In 1903 he founded Charles Ruwolt & Co in Wangaratta, Victoria, as a manufacturer of windmills. After 1922 Ruwolt began manufacturing road-making equipment, crushing machinery for mine-work, and hydraulic presses for the car industry. By 1938 it was one of the largest engineering companies in Australia, occupying 20 acres (8 ha) and employing 600-700 workers. Its steel foundry was one of the largest and best-equipped in the country. The company made light artillery and trench mortars during World War II, and its workforce grew to 2000. Ruwolt died on 4 November 1946. His great industrial enterprise was bought in 1948 by Vickers Ltd (UK) and subsequently operated as Vickers Ruwolt. Despite further takeovers and mergers, the Ruwolt name survived until 1995, when ANI Ruwolt was merged into ANI Engineering, part of the Bradken group. The engine was purchased by the museum [from Wills Timber Group] through Dalgety Farmers Ltd, Coleraine, Victoria in 1985.